Cavendish wins 16th Tour de France stage in Cap Fréhel. Home/Grand Tours/Tour de France/Cavendish wins 16th Tour de France stage in Cap Fréhel. He laughs, he cries, he rails and insults and hugs and smiles. He’s a cauldron of emotions barely controlled, a tightly wound bundle of nerves, a volatile mix of sorrow and joy. 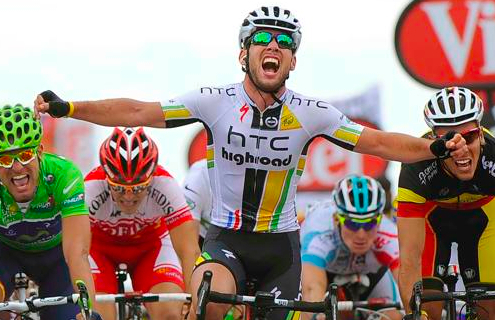 Mark Cavendish is a 5’7″ Tour des Emotions. Today in Brittany’s Cap Fréhel he swung back to happy and as usual he did it at high speed, fast-twitched, full gas. Nobody got within a bike length of him. Stage five’s run from Carhaix to Cap Fréhel had sprinter marked on the profile but it wasn’t a guarantee. In fact, with all the crashes caused by wind, narrow roads and nerves, not even Alberto Contador was sure he would make the finish. This time it was left to Cavendish to do things the hard way, on his own, weaving thru freeway traffic. The timing and coordination of his lead-out was off, with Tony Martin going so hard that he gapped teammate Matthew Goss and left the Manx Missile far behind. Taking advantage of the foul-up and confusion, Team Sky’s Edvald Boasson Hagen shot off the front, a move that had brilliance and possibility. For a moment, it appeared the Norwegian had fooled everyone right at the flamme rouge. No shingles but also, no victory for Boasson Hagen. He was swept up as Philippe Gilbert made his move and if the finish had a slight uphill grade he might have won. Now with 150 meters to go, he made everyone pay for the disrespect. Turbo on, blasting clear, both arms up, wide grin, hugs for teammates, life is good again. Now he can relax and let everyone in the media know he proved the doubters wrong. 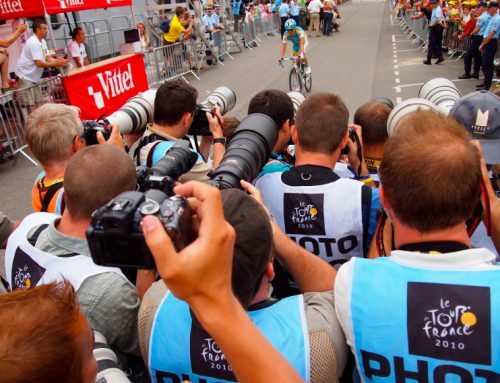 Uhh, what doubters, who doubts a rider with 16 Tour de France wins? But if you need to generate anger and revenge to make yourself ride faster, so be it. 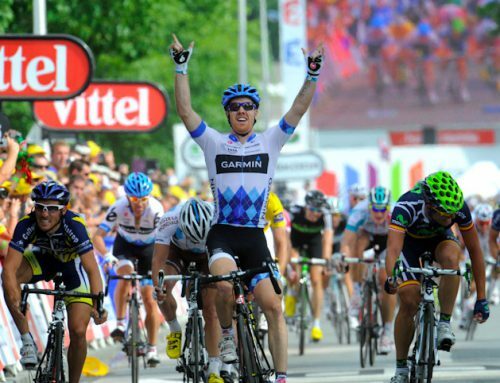 Works for Cavendish, doesn’t work for battling buddhist Tyler Farrar. “It was proper hard. My legs were going, going, going…I’m really happy,” said Cavendish. “It’s just good that we came out against adversity.” Yup, adversity all around, fellah, it’s The Tour. Sadly, a few riders didn’t make the finish line at all today. Radio Shack’s Jani Brajkovik lay curled up on the side of the road and barely moved for several minutes. He’s out of the tour and at the hospital. Tom Boonen (Quick Step) may also be a scratch tomorrow after hitting the tarmac. He limped to the finish but all visual evidence points to a broken collarbone. So far Alberto Contador has had a miserable Tour and now he needs a new Saxo kit after scraping himself up pretty good. No injuries by all appearances. 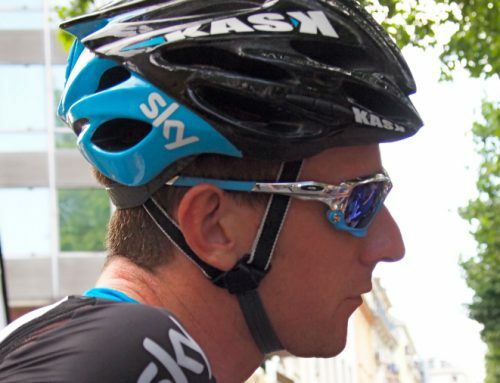 He must be feeling like Lance Armstrong did last year, dogged by crashes and bad luck. He is praying he makes it to the mountains in one piece. Garmin keeps the yellow jersey with Hushovd and HTC-Highroad gets their first stage win, “opening the account” as Phil and Paul like to say. There is joy for Mark Cavendish and when he’s happy, team sponsors are happy. A few more stage wins at this year’s Tour and team owner Bob Stapleton might even snag a new sponsor. It was another crazy day @ the TdF. For a moment it looked like war was coming, when Leopard could be seen pulling the peloton when both Gesink and Contador hit the deck and tried to regain contact with the bunch. Some of the television commentators remembered their viewers of last year, when the Schlecks hit the slippery asphalt and Cancellara urged the whole peloton to wait for them. What a contrast it was… Mais c'est la course et c'est vrai, le Tour ne pas attendre. Instead of writing about the week one crashes the news item is week 1 stages without a crash! Now that's something to talk about! The odds are against them and if they can avoid it, they're setting a record, they're doing the impossible! Nope, any Week 1 stage with no crashes is called un-eventful. Then all the "Stay near the front" statements, does anyone know the impossibility of having everyone near the front, hence the crashes due to everyone thinking the same thing, its equivalent to riders passing a packed grocery store yelling, "Stay near the front of the cashiers line! ", you'd see ladies bumping each other, shopping carts toppled over, and plenty of ingrown toe nails bloodied and achelies tendons bruised! Let the race be the race, there is no need to change it! Sprinters move to the front on sprints, GC climbers to the back, Climbers/GC boys move up on the climbs and sprinters to the back. Pretty easy and no sprinter even gaining 30 seconds per stage will ever win the Tour so GC riders, chill out! and move to the back on sprints.